One of my family’s favorite meals is chicken drumsticks baked in the the oven. I usually buy the large value size pack of drumsticks when they’re on sale for a $.99 a lb. (Sometimes even $.77 cents a pound- that is stock up time!) I cook as many as I can fit on the baking pan, then freeze the leftovers to use in another dish. 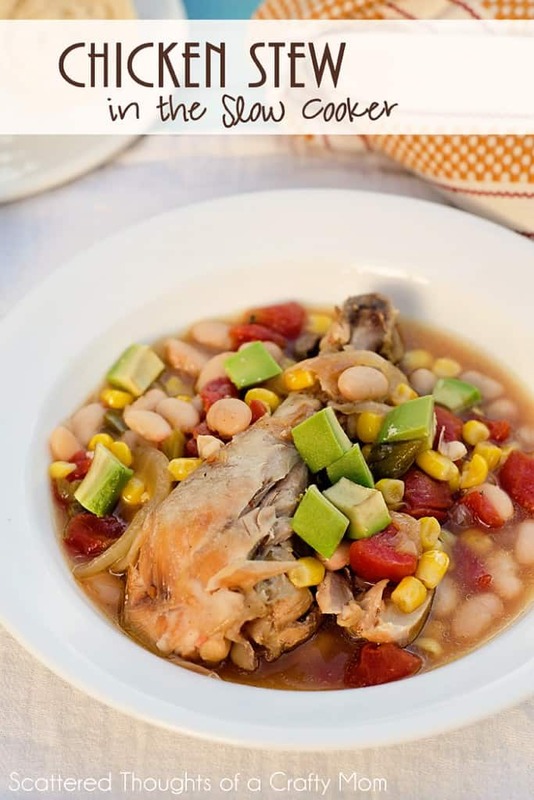 With the absolutely freezing weather we’ve been having, I thought a chicken stew would be a great way to use up the leftover drumsticks. We all loved this stew (including my picky son!) The stew is done in the crock pot, so it’s really easy. I actually even went to the extra effort of sauteing the onions and peppers before adding them to the crock pot! Heat oil in large skillet, saute onion and bell pepper for about 5 minutes Add the garlic and green chilies and saute another minute or so. Transfer the sauteed onion mixture to the slow cooker. Add chicken pieces to the slow cooker and add can of tomatoes on top of chicken. sprinkle the salt, pepper, cayenne, cumin, garlic. Stir Worcestershire sauce into the chicken stock and add to the slow cooker. Mix the cornstarch with 2 to 3 tbs of water and gently stir into the stew. Gently mix in the corn and beans and cook for another 30 to 40 minutes.